"This is a farm-style French dish that my Mom's German grandmother taught her to make as a young girl. It's easy and similar to our pot roast meals and very tasty as well. Mom updated the one she had to make it even easier for us to make years later. She made enough to make a different meal with her leftovers as well." Pour the olive oil into the bottom of a heavy Dutch oven, and place over medium heat. Sprinkle the chicken pieces with salt and black pepper, and cook in the hot oil until browned on both sides, 5 to 8 minutes per side. 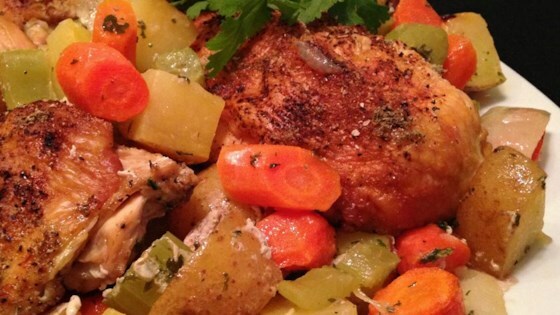 Add the carrots, potatoes, celery, onion, garlic, chicken bouillon cubes, and water, and stir to combine. Bring to a boil, and cover the Dutch oven. Place the Dutch oven into the preheated oven, and simmer, covered, until the vegetables are tender, about 45 minutes. I use leg quarters and fix 2 more than I need for future use. 1 cube bouillon and 1 package of dry onion soup (2 green onion if your want the color); we started using an oven bag and prepared the bag as directed on the box instead of frying the chicken as before. Mom also had us place all items in bag, plus dry onion soup and one cube of bouillon instead. With the leftovers, we made chicken vegetable soup. I followed the recipe as written. It was very flavorful and the chicken was great. Even my pickiest child, who normally won't eat chicken or potatoes, ate it all up! Loved it! Wouldn't change anything in this recipe. I followed the recipe as stated. We could actually taste the vegetables! This is a very good recipe.